The tenth annual general meeting and get-together of Panadura United Merchants Association (PUMA) was held at the Holiday Resort, Wadduwa recently. 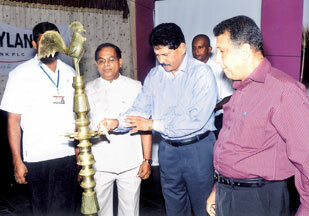 Here H.M. Dharmasena Panadura SP lights the oil lamp. Tissa Kathiriarachchi former MP and K.S. Sisira Kumara President of PUMA are also in the picture. Pic: Susil Ratnaweera, Panadura North Group Corr. The annual Best Corporate Citizen Award ceremony organised by the Ceylon Chamber of Commerce took place at the Cinnamon Grand on 4th of November 2011. Nestlé Lanka PLC bagged the Best Corporate Citizen Award 2011. MAS Intimates (Pvt.) Ltd. won the first runner-up and Hatton National Bank became the second runner-up. Link Natural Products was the winners in category B, (below Rs. 15bn turnover category) while Colombo Dockyard PLC and NDB Bank PLC came second and third respectively in category B. The Hong Kong and Shanghai Banking Corporation Ltd. (HSBC) was the winner of Community Relations and CSR category, MAS Intimates (Pvt.) Ltd. won the Environment category, Hatton National Bank PLC won the Governance and Economic Contribution category while Nestlé Lanka PLC bagged the Employee Relations and Customer and Supplier Relations Category awards.